One day during his sophomore year at Kelly High School in Chicago’s Brighton Park neighborhood, Carlil Pittman lagged behind in the cafeteria after lunch and didn’t get up to go to class when the bell rang. He had just found out his girlfriend was pregnant. He didn’t act out and wasn’t violent toward anyone, but a security guard noticed him lingering at the lunch table and brought him to the school’s main office, where they proceeded to expel him for low grades. 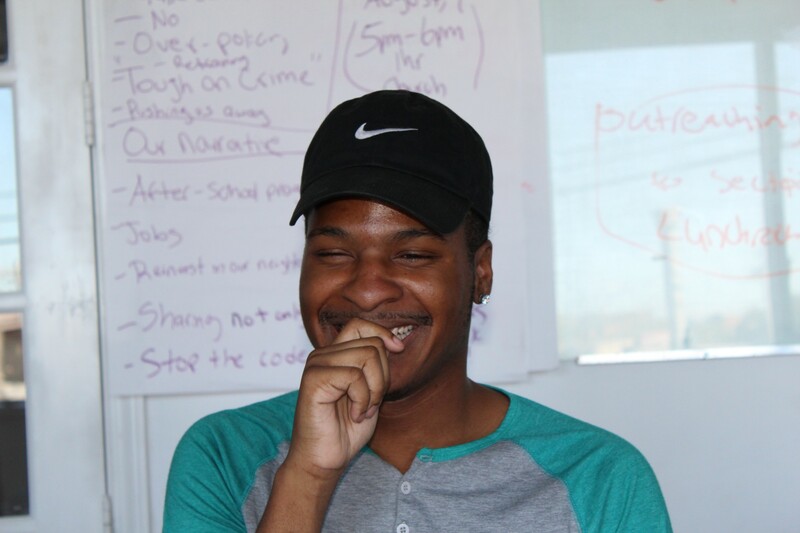 Pittman is now 23 and works as a youth organizer with Voices of Youth in Chicago Education. VOYCE works with students living on the South and West sides, giving them a platform and the resources to advocate for themselves and their education. Pittman worked with VOYCE to pass bill SB 100 through the Illinois House of Representatives. The bill is part of the organization’s “common sense” discipline campaign which pushes for an end to the harsh disciplinary policies employed by CPS. Before the bill was implemented, students could be suspended up to two weeks for non-violent offenses, such as talking back to teachers or skipping class. Now because of SB 100, schools can no longer suspend students for more than three days unless they pose a threat to students and faculty. Suspended students must also be given the opportunity to make up their missed work. SB 100 went into effect Sept. 15, 2016 with the support of state senators and representatives, including Sen. Kimberly Lightford (D-Westchester) and Rep. Will Davis (D-Hazel Crest). This bill also addresses the larger issue that VOYCE deals with: the school-to-prison-pipeline. This is a theory that states students who expelled or suspended from school are more likely to eventually enter the prison system. Antonio Magitt, 18, a senior at Roosevelt High School, has been active in VOYCE since his junior year. He now works as an intern at the organization’s Albany Park office with Pittman. “It stands for exactly what it is,” Magitt said about the organization. “When we get together, it’s led by the students,” and they are encouraged to evolve as activists. Antonio Magitt, 18, has been involved with VOYCE since he was a junior in high school and now works as a student intern in the organization’s Albany Park office. Magitt knows firsthand about the harsh exclusionary disciplinary policies CPS used to have in place and has been affected by them throughout his education, having attended five different schools in his life. He caused trouble and got into fights throughout elementary and middle school, which got him expelled. He eventually enrolled at an alternative school his eighth grade year after physically assaulting a police officer at school, which led to a two-week suspension and ultimately expulsion. “I don’t want to say… it’s okay for me to do stuff like that, but I was having a really bad day at the time, dealing with a lot of personal things,” he explained. Magitt was then transferred to the alternative Banner North Academy in the Austin neighborhood, which he felt left him overwhelmingly underprepared for high school. As a result, his first years at Roosevelt High School got off to a rocky start. Then he had a revelation the summer before his junior year. “I came to the conclusion to start changing my ways or else I’m gonna end up either in jail or dead. Luckily I did that and this is where I’m at now,” he said with a grin on his face. Pittman and Magitt were both victims of the harsh discipline policies employed by CPS until the 2012-13 school year. These policies were not unique to Chicago. Jon Schmidt, clinical assistant professor of education at Loyola University Chicago, explains that it followed the trend of law and order that was popular across the country starting in the ‘90s with the Clinton crime bill. “It hasn’t really worked out that way,” he added. CPS has since shifted from exclusionary to restorative disciplinary policies, which include counseling and after-school programs. The district reports expulsions amd suspensions have decreased significantly since these new measures have taken effect. Out-of-school suspensions have decreased by 67 percent, according to CPS data, while the rate of expulsion has decreased by 74 percent since the policy changes were implemented in 2012. Although these numbers are encouraging for those at VOYCE, especially Pittman, it does not mitigate the effects the policies had on students like Magitt or himself. Pittman hopes that the education system his three young sons enter is better than the one that expelled him eight years ago. He vows to continue to fight for better opportunities for all students, both in and outside of school. Candace Moore is optimistic about the drop in suspension and expulsion rates in Chicago Public Schools, but worries that the city may be straying away from confronting the deeper issue. Moore is a staff attorney at the Chicago Lawyers’ Committee for Civil Rights Under Law where she helps protect the educational rights for kids across the city by providing direct representation for students facing expulsion to policy work. She is passionate about eliminating CPS’s zero tolerance policy, which includes tough disciplinary practices that were in place until a few years ago. The policy reflected a national trend that began in the 1990s starting with the Clinton crime bill, said Jon Schmidt, clinical assistant professor of education at Loyola University Chicago. The Collaborative for Academic, Social and Emotional Learning has found that suspensions, which were very popular under the zero tolerance agenda, have been shown to actually lower achievement while also leading to higher drop-out and incarceration rates. “Restorative justice was really available all the way back to the 1990s,” Schmidt said. However, it has historically been presented as an option for schools, not a requirement. “CPS doesn’t have a ‘zero tolerance policy’—far from it. We emphasize restorative justice,” said CPS communications director Emily Bittner. The restorative justice practices Bittner is referring to include partnering with outside groups and taking time to check in with students throughout the school day. To some extent, these practices have been successful. On Sept. 22, 2016, CPS announced that expulsion and both in- and out-of-school suspensions reached an all-time low. According to CPS, out-of-school suspensions decreased by 67 percent while expulsions decreased by 74 percent since 2012, when the disciplinary shift began. A University of Chicago study found that during the 2009-10 school year, approximately 25 percent of high school students received at least one out-of-school suspension each year. By the 2013-14 school year, that rate dropped to 16 percent. Now the school district has created an Office of Social and Emotional Learning, which partners with CASEL, to spearhead the change in disciplinary practices. A key change in policy that’s taken place during this transition is state bill SB0100. This bill, sponsored Sen. Kimberly Lightford (D-Westchester) and Rep. Will Davis (D-Hazel Crest), makes changes across the state, most notably limiting the maximum length of a suspension to three days unless the student poses a threat. It has been in effect since Sept. 15, 2016. At its foundation, the bill aims to make exclusionary discipline policies, such as suspension and expulsion, a last resort. It is one of many bills which have made changes regarding a suspended student’s re-integration into the classroom. Previously, a student could be suspended and miss up to two weeks of class and schools were not required to help these students make up missed work. Because of SB0100, students are given that chance. Antonio Magitt, 18, is a senior at Roosevelt High School who was regularly disciplined at school until recently. He has attended five schools, mostly due to expulsions. “It’s good that we have a bill like SB0100,” Magitt said. He feels that the bill would have benefited him if it were implemented earlier. While at Roosevelt, Magitt said he was suspended for two weeks after a verbal argument with a guidance counselor who he felt was mistreating him. “Every school in the state is going to be playing by the same rules,” she added, which is a significant change, especially for students that attend charter schools. Right now, the implementation phase of the bill is underway. An issue that both Moore and Schmidt agree on is that CPS needs to work on enabling teachers to be prepared to handle disciplinary situations in the classroom. “Teachers are now being encouraged, in some ways mandated, to keep kids in the classroom where a year ago, two years ago, they could say that’s it, you’ve got to go,” Schmidt said. “As a teacher, I feel like my hands are tied because before I would remove them from the school, but now I can’t do that,” Moore said. She explained that for the most part, teachers aren’t given another way of dealing with behavioral problems. Outside organizations are beginning to give CPS teachers the training to deal with these types of situations, which has not been a requirement in the past, Schmidt said. Although restorative justice practices have resulted in decreased suspension and expulsion rates, Moore thinks Chicago should be investing its money in “counseling, social work, [and] mental health”—things that are known to work but have been avoided because they require financial resources, which have been hard to find with the continuous budget cuts. While restorative justice initiatives have shown measurable improvements, they can only do so much.